This recipe was inspired by this Williams-Sonoma recipe I made a few years ago. Preheat oven to Broil (high). 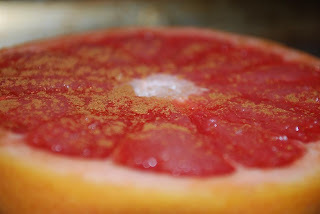 Place grapefruit halves on a baking sheet. Drizzle each half of the grapefruit with melted coconut butter and spread with a pastry brush, spoon, or knife. Sprinkle with (maple or date) sugar and cinnamon. Broil for 3-7 minutes (depending on oven heat and space between sheet and broiler), until the tops begin to bubble and the sugar begins to caramelize. Remove from oven, garnish with mint, and serve. This recipe is so easy and is so flavorful! 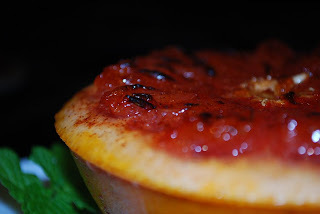 The spicy cinnamon is a perfect pairing with the floraly, citrus flavors of the grapefruit. The perfect way to end a holiday meal or to satisfy a sweet tooth, without the heaviness or guilt. I prefer the maple sugar for this dessert! Get your awesome Paleohacks Cookbook.